In 1970, Pony Cars and Muscles, were at the height of their popularity. And Plymouth wanted more of this market. 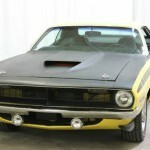 To achieve this goal the 1970 Barracuda was redesigned and separated from its Valiant roots. 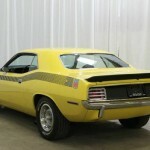 The new Barracuda did away with the original fastback design and was offered in coupe and convertible models. The all-new Barracuda was built on a shorter and wider version of Chrysler’s B-body platform which to be known as the E-body platform. The E-body platform would be shared with the Dodge Challenger, but no body panels would be shared between the cars. 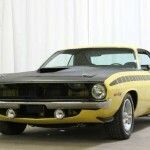 The Challenger had a 110 inch wheelbase while the Barracuda used a 108 inch wheelbase. 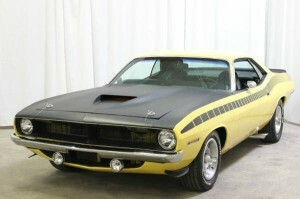 Three versions of the Barracuda were offered in 1970: the base Barracuda, the luxury Gran Coupe, and the sport model ‘Cuda. The new and wider engine bay on the 1970 Barracuda allowed the release of Chrysler’s 426 cubic inch Hemi engine for the regular retail market. The Barracuda and Barracuda Gran Coupe had two six-cylinder engines available: a new 198 cubic inch version of the slant-6, and a 225 cubic inch engine. There was also a choice of V8s configurations: a 318 cubic inch with a 2-barrel carburetor or the 383 cubic inch engine with either a 2-barrel carburetor or 4-barrel carburetor. The 2-barrel engine had singe exhaust and the 4-barrel had dual exhaust. There was also a 440 cubic inch 4-barrel Super Commando option, a 440 cubic inch 6-barrel Super Commando Six Pak, and a 426 cubic inch Hemi. The 440- and Hemi-equipped cars received upgraded suspension components and structural reinforcements. 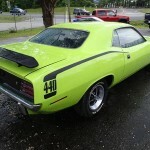 Other Barracuda options included decal sets, hood modifications, and some unusual “high impact” colors such as “Vitamin C”, “In-Violet”, “Sassy Grass Green” and “Moulin Rouge”. A street version of the Trans-Am Series All American Racer was offered as the AAR package. The AAR Barracuda was powered by the 340 cubic inch “Six Pack” engine. 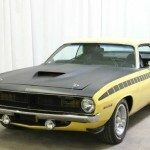 For more information on the Barracuda, see the posts on the 1964-1966 Plymouth Barracuda or the 1967-1969 Plymouth Barracuda. To find your own Classic Car or to sell your Classic Car, see the listings in Classics for Sale. 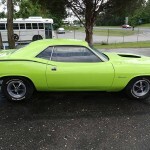 This entry was posted in Barracuda, Plymouth and tagged B Body, Challenger, E-Body, Hemi, Mopar, Pony Car. Bookmark the permalink. straight to the facts.good article.